I joined flattr about a month ago as an experiment; Other photographers have joined the service as a way of generating small revenue from fans. 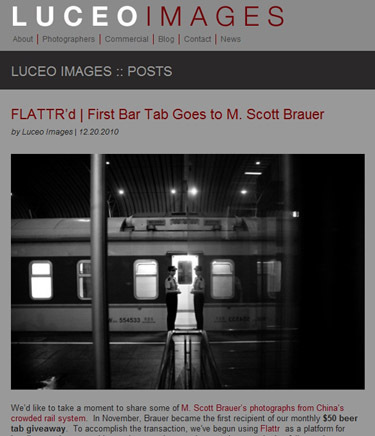 Now, the good folks at Luceo Images have chosen my work, China’s Crowded Railways, for their first monthly flattr bar tab giveaway. My admiration goes out to Luceo for their efforts to support other photographers, and I’m honored to have been a recipient of some of that support. In that month, I’ve received about 40 other flattr clicks, ranging from a few cents to a few dollars apiece. The viability of micropayments as a funding source for photography remains to be seen, but everything’s got to start small.